Every southern spring and summer, after the Sun has risen into its 24-hour circuit around the skies of Antarctica, the Ross Sea bursts with life. 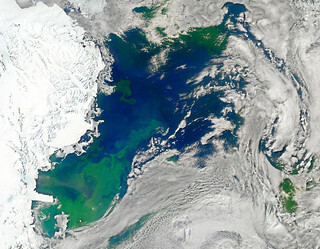 Floating, microscopic plants, known as phytoplankton, soak up the sunlight and the nutrients stirring in the Southern Ocean and grow into prodigious blooms. Those blooms become a great banquet for krill, fish, penguins, whales, and other marine species who carve out a living in the cool waters of the far south. This true-color image captures such a bloom in the Ross Sea on January 22, 2011, as viewed by the Moderate Resolution Imaging Spectroradiometer (MODIS) on NASA’s Aqua satellite. Bright greens of plant-life have replaced the deep blues of open ocean water. The Ross Sea is a relatively shallow bay in the Antarctic coastline and due south from New Zealand. As the spring weather thaws the sea ice around Antarctica, areas of open water surrounded by ice—polynyas—open up on the continental shelf. In this open water, sunlight provides the fuel and various current systems provide nutrients from deeper waters to form blooms that can stretch 100 to 200 kilometers (60 to 120 miles). These blooms are among the largest in extent and abundance in the world. Scientists have hypothesized that the Modified Circumpolar Deep Water is the engine behind the blooms, stirring up just the right mix of trace metals and minerals from the deep to sustain plankton growth. This month, researchers aboard the U.S. icebreaking ship Nathaniel B. Palmer are cruising in the Ross Sea in search of the signatures of this current system. NASA image courtesy Norman Kuring, Ocean Color Team at NASA Goddard Space Flight Center. Caption by Mike Carlowicz, with information from Hugh Powell, COSEE-NOW.